WITHIN AN HOUR OF THEIR PRESENTATION, SKS STUDIO AND PARTNER 40NORTH WIN THE LANDSCAPE ARCHITECTURE PROJECT FOR THE ROYAL ATLANTIS RESORT & RESIDENCES IN DUBAI. In 2014, Kerzner International and parent company The Investment Corporation of Dubai (ICD) announced its plans for the $1.6 billion The Royal Atlantis Resort & Residences located adjacent to Atlantis on the crescent of Palm Jumeirah. 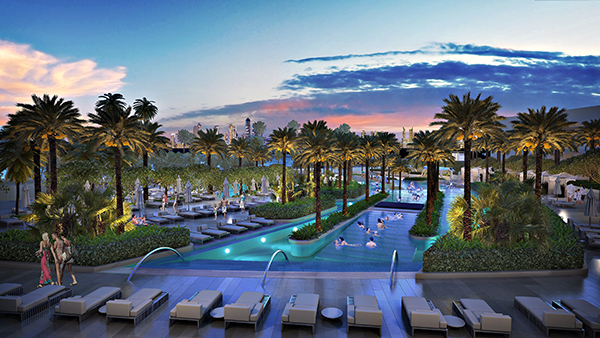 This highly anticipated property is scheduled to open in 2019, expanding on the Palm’s 15-year success as one of Dubai’s most touted landmarks. In a city known for its grand architecture, The Royal Atlantis is destined to stand out even amongst the existing grandest of engineering feats. With a theme that merges fire and water, The Royal Atlantis is a modernist design of stacked blocks with overhangs and sky courts overlooking the Arabian Gulf on one side and the Dubai skyline on the other. 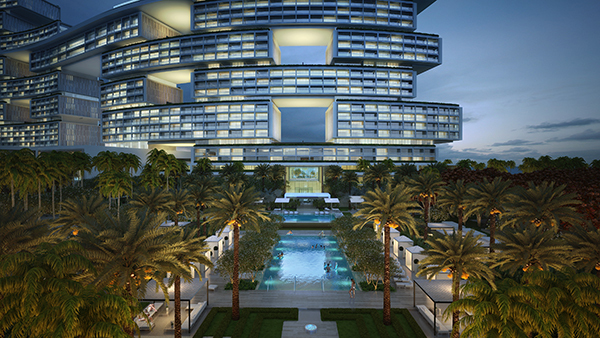 In all, the property consists of approximately 800 hotel rooms, 250 luxury residences and retail offerings. Kerzner International held a design competition in which firms competed to be the landscape architect for The Royal Atlantis. “When we learned of the project, our first inclination was to partner with 40North. John Galloway, 40North president, and I have known each other for years. Our history goes way back on other projects. We both know our talents and how they complement one another. It was a wise and natural partnership for a project of this scope and notoriety,” explains Sean Simms, SKS Studio president. Simms and Galloway arrived in New York City with upwards of 30 presentation boards to present to Kerzner’s CEO and senior executive team. Within an hour of wrapping up their presentation, the two were awarded the project, the largest in each of the firms’ histories. “It was one of, if not the most, exciting moments in our careers. Kerzner International’s number one core value is ‘Blow away the customer.’ We share that same value and that’s exactly what our presentation proved we could help them do,” recalls Simms. SKS Studio and 40North are the visionaries behind designing all outside spaces and outdoor areas on the building from Sky Courts featuring suites with magnificent landscaping to stunning acrylic pools 46 storeys up. From the hardscape, pools and water features to the landscape, SKS Studio pushes their creativity, design skills and practical know-how beyond the limits to turn the vision of this extraordinary property into a tangible experience for guests and residents. “Kerzner International is renowned for their demanding expectations. They hire the best design teams in the world and challenge them. We view working with them and other firms on this project as an honor and thrive on collaborating to create something that has never been seen before, and some things that have never been attempted,” states Simms. Collaborating with other superb caliber design firms from around the world is standard operating procedure for SKS Studio. On The Royal Atlantis, it involves working with two architecture firms in New York City and Toronto, two interior design firms in Paris and London, engineers in London, New York City and Dubai, plus the Dubai-based client. “Our landscape architecture team has worked on several projects in similar harsh environments. Extreme heat, salt air and the like are challenges, but we know the type of landscape that thrives in this environment and what does not. We created a proven palette down to where shaded and sun-drenched areas must be for both guests’ pleasure and the landscape to remain lush,” explains Simms. There is also the challenge of scale with which SKS Studio contends. “This is a 46-storey building on a man-made island with an expected 1,000 units behind it. 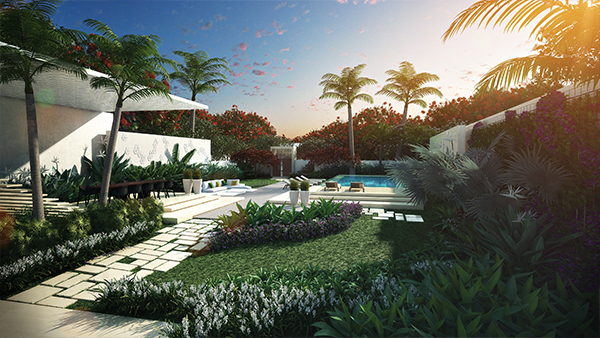 Our landscape architecture design creates luxury spaces that discerning guests and residents demand balanced with the boutique experience they expect. Relaxation, privacy and immersion in the environment are paramount,” states Simms. The design output is a culmination of pushing the limits of both design and engineering. The technical challenges alone of building on a man-made island of sand are more layers added to project’s complexities. “Scrutinizing and obsessing is what we do and what we’re challenged by Kerzner International to do. 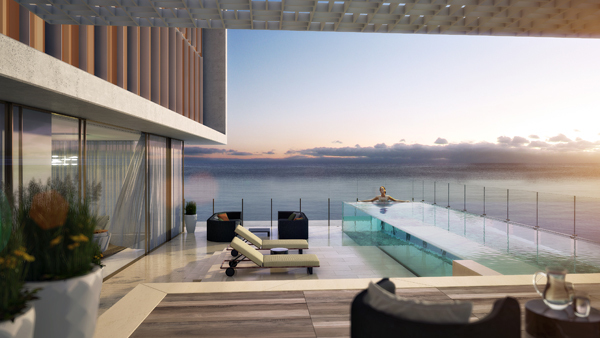 There isn’t one square meter of The Royal Atlantis that has not meticulously designed, which is the reason it will be unlike any other property in the world,” explains Simms. More amazing ideas for The Royal Atlantis have been thrown away than are brought to the table on some other projects. SKS Studio will have been working on The Royal Atlantis’s landscape architecture for five years by the time it celebrates its grand opening in 2019. That timeline is lightning fast for a project of this size and scope. “The Royal Atlantis is not a check-off box project, but rather a push-yourself-beyond-what-anyone-could-possibly-imagine-under-tight-time-restraints project. We’re thinking ahead to what will be cutting-edge in two to three years. One idea spurs an even better one so changes are made, but one change affects 10 more down the line. Things happen in the field that evolve the landscape architecture design, yet we’re careful to hold on to the original vision as well. 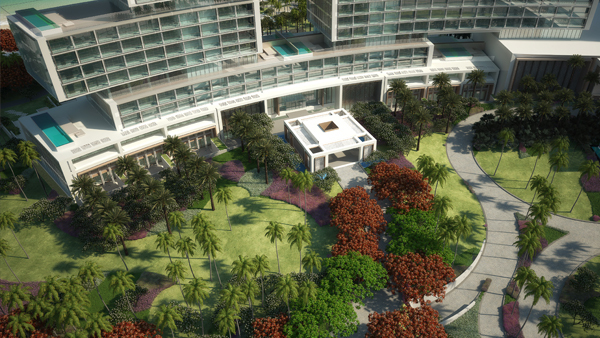 The Royal Atlantis is built for those who can travel anywhere in the world, and they chose this property,” says Simms.